The Beauty of Life: A New Use for Bronzer: Make it a Blush! A New Use for Bronzer: Make it a Blush! With summer two months in, I now have a nice (if uneven) tan and need to change up my daily makeup a bit. I’ve found that after a weekend in the sun, pink blush is not the answer to my almost sunburned cheeks. Instead, I dream of the warm, golden glow that’s on all the ads with the women in expensive white bathing suits on yachts. I decided to experiment with bronzers and use them in place of blush. After a few Lindsay Lohan (post Mean Girls) mishaps, I found two bronzers that create the perfect golden goddess look. 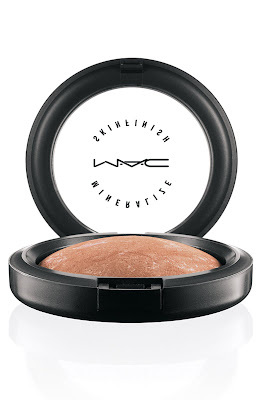 M.A.C Mineralize Skinfinish in Sunny by Nature ($27): This addition to the Mineralize Skinfinish line is part of the Colour Craft collection and keeps the colors fresh with a bit of metallic shimmer. The key is to find a fine powder bronzer -- this one is velvety soft -- that highlights your natural tan instead of just darkening the skin. This one is a rich bronze with swirls of pink pearl and gold highlights, which looks amazingly natural on any skin tone. If a golden goddess could blush, this would be the look. 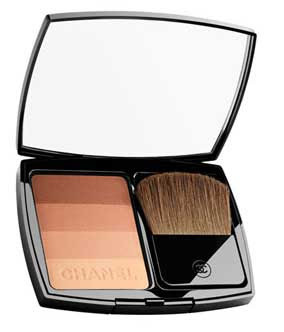 Soleil Tan de Chanel 4 Facettes Bronzing Powder ($65): This is the one big ticket item for the perfect summer glow. Over the course of a summer, I’ll go through the whole spectrum of brown, and I’m loving that this powder bronzer keeps up with my chameleon skin. With a palette of four subtle, illuminating shades, I can either wear the colors alone or blend together the lighter shades in May and move onto the darker shades in August. The formula is extremely light and can be layered for effect or used to contour without ever looking dull or flat. Simply a healthy, gorgeous, perfect glow! Disclosure: These products were furnished by PR representatives for M.A.C and Chanel, respectively. I always use my bronzers for blush...that's why I buy them. I have extremely fair skin but with warm tones. I look better in autumn colors and so pink blushes unless they are warm pinks look ridiculous. Bronzers look lovely on my cheeks. However, on the rest of my face or on my neck and bust they look brash. I have nearly used my Dior bronzer completely. I may have to treat myself to that lovely Chanel bronzer (sigh).